There came a point when Préciosité went too far. Playing shepherds and shepherdesses in a salon could not last forever. So by the time Molière, born Jean-Baptiste Poquelin, presented his Précieuses ridicules, préciosité had become what Jean-Claude Tournand[i] terms “une fuite poétique,” (a poetical flight). However, it would be unfortunate to trivialize préciosité and especially salons. For one thing, they did have a civilizing influence on members of Paris’ affluent upper middle-class and on aristocrats, many of whom made a point of becoming honnêtes hommes, in the worldly acceptation of honnêteté. Molière‘s Précieuses ridicules were played for the first time on 18 November 1659. It is a farce and therefore resembles the Italian commedia dell’arte one-act or short improvised plays. These featured characters such as Pantalone, Dottore Gratiano, Il Capitano (mostly jealous characters), the occasional miles gloriosus (braggart-soldier), Arlecchino, Brighella, Pierrot, Pulcinella: lazzi, zanni (clever servants who help the lovers) vecchi (old and jealous characters), inamorate and inamorati (lover, lovers). The plot of Les Précieuses ridicules shows the typical reversal of farces, that of the trompeur trompé (or deceiver deceived). Cathos and Magdelon have just moved to Paris and dream of becoming part of the beau monde (the elegant world, that of salons). However, Gorgibus, Cathos’s father and Magdelon’s uncle has different ideas concerning the fate of his daughter and his niece. He wants them to marry sensible and well-to-do young men, in which case “all [would be] well that ends well,” the final outcome of comedies. Two perfectly suitable young men, Du Croisy and La Grange, come a-courting but they are immediately rejected by Cathos and Madgelon. They are not précieux and call a chair a chair rather than a commodité de la conversation (what is useful to conversation). In their attempt to give the French language a purer taste, the précieuses had indeed renamed many objects. So the young men are shown the door, which infuriates Gorgibus. He pays a visit on his daughter and his niece as they are “greasing-up” their faces (se graisser le museau [muzzle]). They tell Gorgibus that courting should be as in the country of Tendre, the map of courting featured in Mademoiselle de Scudéry’s Clélie. They name the villages of Tendre: Billets-Doux (love letters), Petits-Soins (tender loving care), Jolis-Vers (pretty or lovely poems). Moreover, they complain because the young men did not wear feathered hats and designer clothes: “de la bonne faiseuse” (from the right maker). They then announce that they are changing their names. Cathos, Gorgibus’s daughter, wants to be called Polixène and her cousin Magdelon, Aminthe. So the stage is set for a reversal: the deceiver deceived. The young men both decide that they will each clothe their laquais, or men servant, into garments worn in salons and send them to court our would-be salonnières. Cathos and Magdelon are so blinded by their own wishes, that Mascarille’s entrance in a chair carried by porteurs is not viewed as inappropriate and ridiculous. 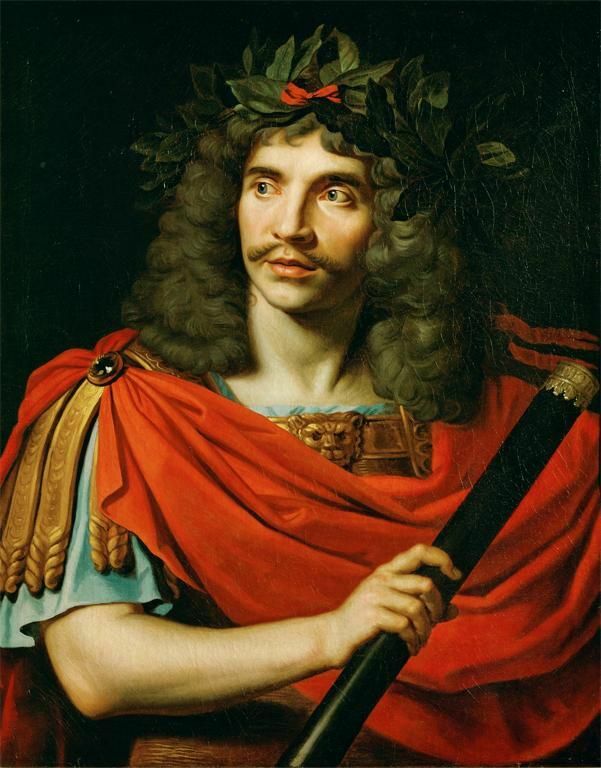 Mascarille (played by Molière) is a marquis. He recites an inferior poem, an impromptu, he has written, pausing frequently to comment on the ingenuous manner in which he has worded his poem. As for the other laquais, Jodelet (played by Jodelet FR), he plays the part of a vicomte and arrives later in the play (Scene XI). Jodelet is a famous but older French actor playing himself, a valet. His face is white because he covers it with flour. The marquis and the vicomte start boasting about their life in various salons and about their abilities as poets and dancers. The spectators are in stitches, but Cathos and Magdelon so wish to be précieuses that they admire the disguised laquais. A few unacceptable words and references are used, but Cathos and Madgelon do not know the difference. They are totally deceived. The fantasy comes to an end during a danse. Violinists had been hired, etc. Du Croisy and La Grange come back and undress their valets so they can be seen for what they are. Earlier (Scene IV) Cathos had remarked that the thought of sleeping next to a naked man was repulsive. Gorgibus returns and the violinists demand to be paid for their services. Gorgibus starts beating them up in the harmless fashion of comedy. So the farce has been played out to its bitter end, bitter for the would-be précieuses and salonnières, and bitter for Gorgibus. This article was posted in 2011.To my knowledge, it is new to most if not all of you. [i] Jean-Claude Tournand, Introduction à la vie littéraire du XVIIe siècle (Paris : Armand Colin, 1984 ), pp. 47-75. Generally speaking, European beast literature consists of two genres: fables and beast epics, or mock-epics. Fables are short, but epics are very long. 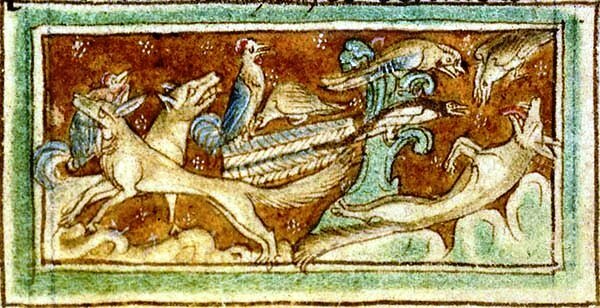 Le Roman de Renart is a beast epic, but it contains the story of a Crow, Tiécelin or Tiercelin, who is led to sing (chanter) by a cunning Sir Fox, and loses his living. Jean Batany calls the various fables “parcellaires” and the entire beast epic, or fabliau, “unitaire.”[i] In short, beast epics are frame-stories (outer stories) that join shorter stories (inner stories). One of our WordPress colleagues added the expression “to eat crow” to my “crowing.” As it turns out, Mr Boehner, Sir Fox, may well be “eating crow,” and the expression “to eat crow,” may be rooted in “The Fox and the Crow.” So, it is possible that “The Fox and Crow” shaped the English language to a greater extent than I suspected and that it may have done so because of the wide dissemination of beast literature in both fables, popular collections of fables, and various epic poems we will name Reynard the Fox stories, an umbrella term. So we have another curtain to raise. Where fables are concerned, there exist several sources. [ii] However, we could begin with Marie de France[iii] who was born in Normandy but then lived in England. She is French literature’s first, chronologically, important woman writer. 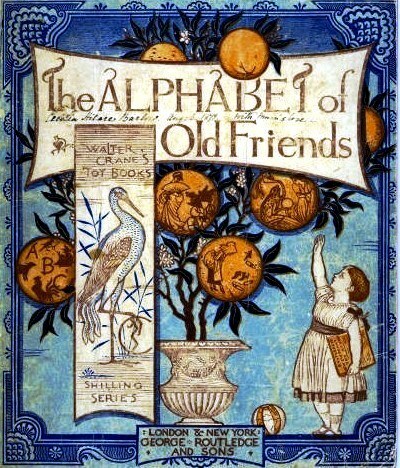 Her collection of fables contains a “Fox and Crow” narrative, entitled “Del corbel e del gupil,” that may predate the Ysopet-Avionnet, but not necessarily. [iv] The Ysopet-Avionnet dates back to the period during which the goupil became a renard, which may explain why her Fox is named gupil. 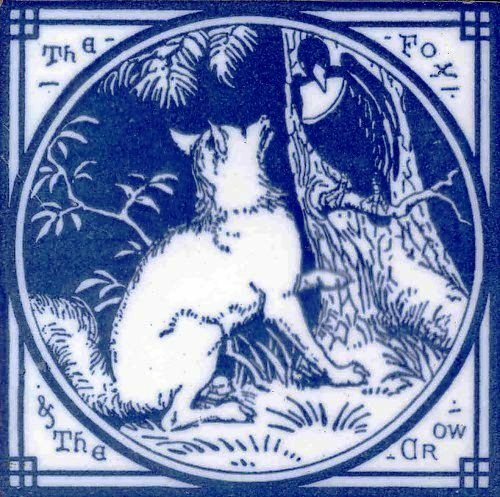 Marie lived in the 12th century and retold 103 ‘Æsopic’ fables, her “Fox and Crow” being the 13th. 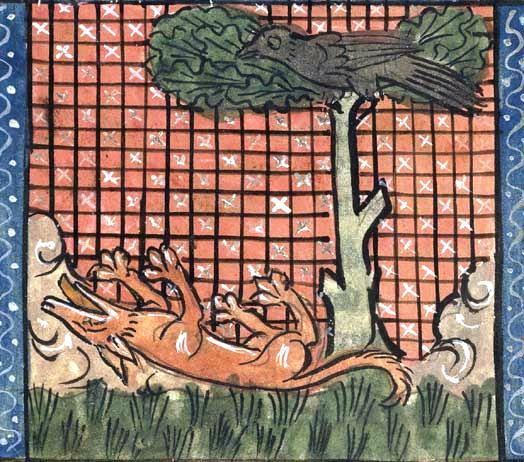 The Ysopet-Avionnet, a widely-used medieval grammar book, contains a “Fox and Crow,” the above-mentioned “Du Renart et du Corbel,” a translation of the Latin “De Vulpe [fox] et Corvo,” fable number 15 in the Ysopet-Avionnet (p. 73). [v] Avianus (Avionnet) lived in the 4th century CE, and he wrote in Latin. 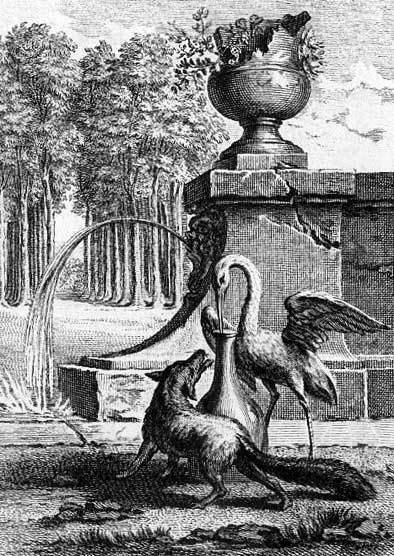 However, “Du Renart et du Corbel” is not one of the 18 fables Flavius Avianus contributed to the Ysopet-Avionnet. It is one of the 64 fables attributed to a Romulus. *Guillaume le Clerc, Bestiaire divin. Manuscript copied in Great Britain, in the last quarter of the 13th century. BnF Ms 14969 fol. 25. The Tales of Uncle Remus (Georgia, US), etc. Reynard (Reinardus) was born in the Ysengrimus and attributed to Nivardus of Ghent. Nivardus is a latinized version of Nivard. The Ysengrimus is a very long poem: 6,574 lines of elegiac couplets. It was translated into English by Jill Mann and is still available (see Jill Mann). The pioneer, however, was John Voigt who translated the Ysengrimus into German. Ysengrimus was the Wolf and Reinardus, the Fox. In French, Ysengrimus is Ysengrin and in English, he is Isengrim. Renart is Reynard. The French Roman de Renart was written between 1170 and 1250. Pierre de Saint-Cloud was its first author, but it has other authors: Richard de Lison, the Prêtre de la Croix en Brie, and others. 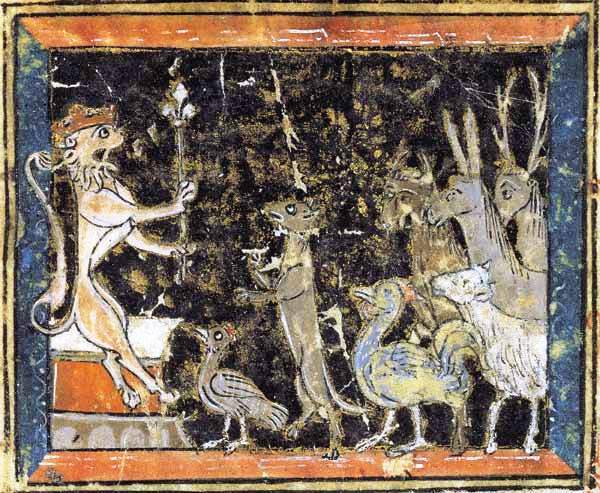 Beginning with the Ysengrimus, beast epics were written not only as mock-epics, but also as satires of a greedy Church. The Roman de Renart then migrated to other lands, the Netherlands in particular. But it also moved to Germany. It was hugely successful in both the Netherlands and German-language states. 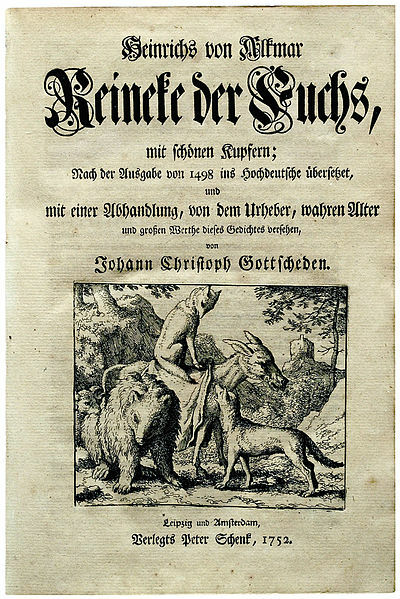 Johann Wolfgang von Goethe is the author of Reineke Fuchs (1793). But the Brothers Grimm also wrote Reynard stories. In North-America, Reynard inhabits Joel Chandler Harris‘ (9 December 1848 – 3 July 1908) Tales of Uncle Remus. However, in The Tales of Uncle Remus, our trickster, the Fox, is replaced by the Rabbit. The traditional North-American trickster is the Coyote. Robert van Genechten (25 October 1895 – 13 December 1945) produced an anti-Semitic version of Reynard the Fox, entitled Van den vos Reynaerde. He was a collaborator. At the end of World War II, Genechten was condemned to death, but committed suicide in his cell to avoid the humiliation of a public and ritualistic execution. 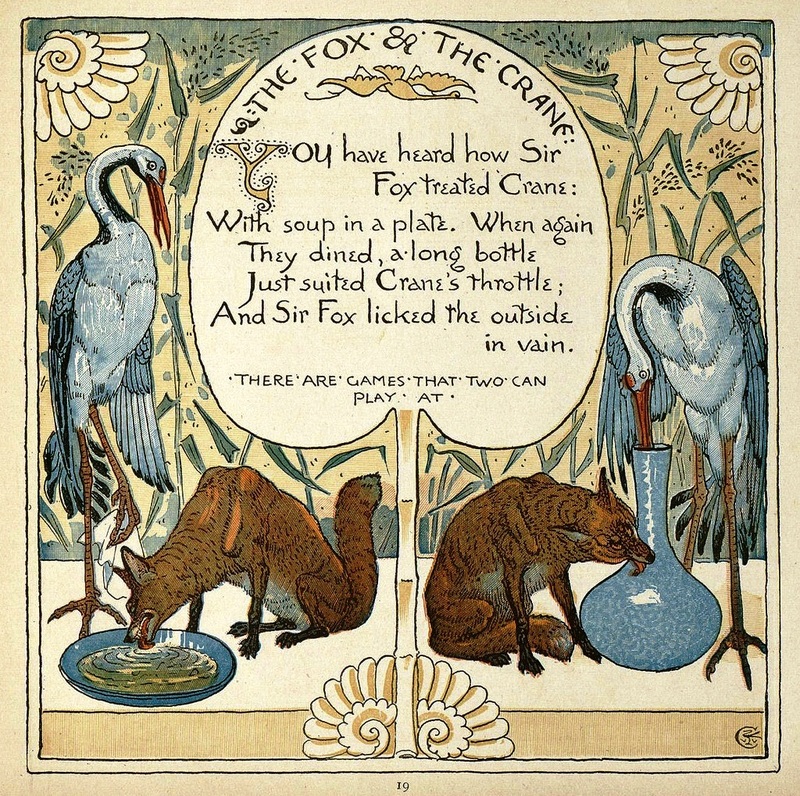 There are so many Reynard stories and, consequently, so many “Fox and Crow” fables that it could argued successfully that expressions featuring linguistic elements such as “to eat crow,” “crowing,” “faire chanter” and, by extension, “chantage” (blackmail) originate in “The Fox and the Crow” and Le Corbeau et le Renart. 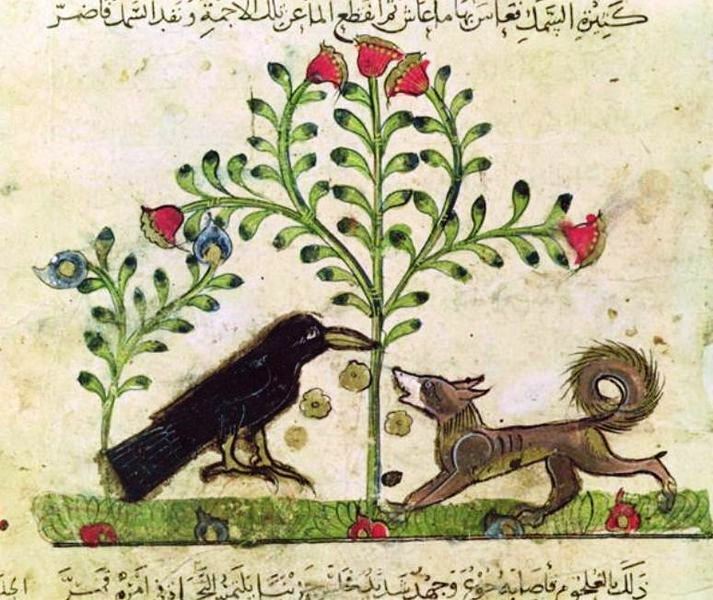 “The Fox and the Crow,” however, is a transcultural text. Related narratives can be found in Ibn al-Muqaffa‘s Kalilah waDimna and, earlier, in the Sanskrit Panchatantra. 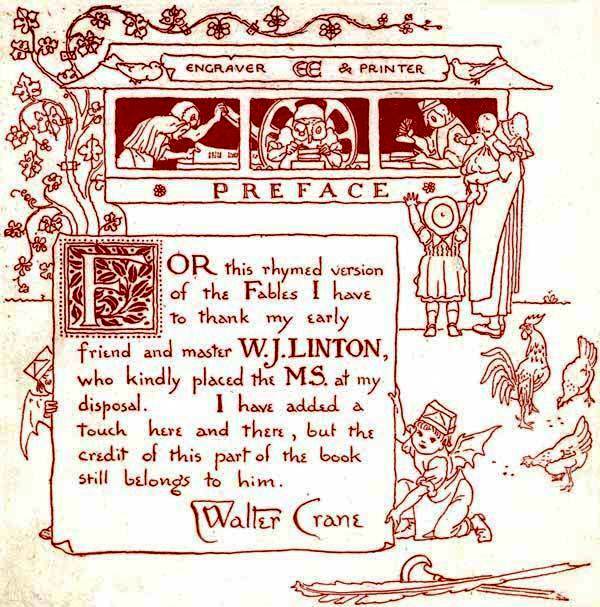 However, allow me to return briefly to a Washington reading of “The Fox and Crow.” In fables, the birthplace of proverbs, among other forms, the crow ends up eating humble pie, or “eating crow.” In farces, however, the deceiver is deceived, le trompeur trompé. 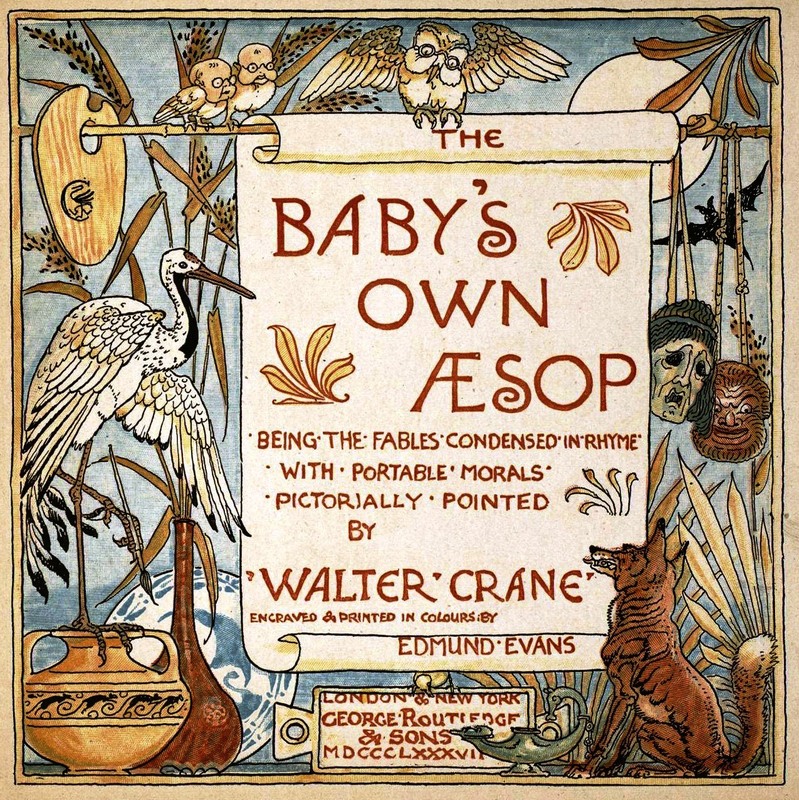 In fables, one can be fooled; Sir Crow opens his mouth and loses the cheese. But Mr Boehner, as Sir Fox, did not succeed in making Sir Crow, President Obama, “crow.” It could be said, therefore, that the shutdown of the American government was not only senseless and far too costly, but that it was… a farce! [i] Jean Batany, Scène et Coulisses [wings] du « Roman de Renart » (Paris : Sedes, 1989), pp. 48-49. [iii] Harriet Spiegel, editor and translator, The Fables of Marie de France (Toronto: University of Toronto Press, 2000 ). [iv] They may have been written at approximately the same time. Renart et Tiécelin le corbeau, Texte établi et traduit par Jean Dufournet et Andrée Méline, GF-Flammarion, 1985. Tome 1, p. 251-261. Ladislas Starewicz produced a “Fox and Crow” animation. There came a point when Préciosité went too far. Playing shepherds and shepherdess in a salon could not last forever. So by the time Molière, born Jean-Baptiste Poquelin, presented his Précieuses ridicules, préciosité had become what Jean-Claude Tournand[i] would be unfortunate to trivialize préciosité and salons. For one thing, they did have a civilizing influence on members of Paris’ affluent upper middle-class and on aristocrats, many of whom made of point of becoming honnêtes hommes, in the worldly acceptation of honnêteté. Molière‘s Précieuses ridicules (1659) were played for the first time on 18 November 1659. It is a farce, and therefore resembles the Italian commedia dell’arte, one-act or short improvised plays featuring stock characters such as Pantalone, Dottore Gratiano, Il Capitano (mostly jealous characters), the occasional miles gloriosus (braggart-soldier), Arlecchino, Brighella, Pierrot, Pulcinella: zanni (clever servants who help the lovers), vecchi (old and jealous characters), inamorate and inamorati (lover, lovers). Two perfectly suitable young men, Du Croisy and La Grange, come a-courting but they are immediately rejected by Cathos and Madgelon. They are not précieux and call a chair a chair rather than commodité de la conversation (what is useful to conversation). In their attempt to make the French language more elegant, the précieuses have indeed renamed many objects. So the young men are shown the door, which infuriates Gorgibus. He pays a visit on his daughter and his niece as they are “greasing-up” their faces (se graisser le museau [muzzle]). They tell Gorgibus that courting should be as in the country of Tendre, the map of courting featured in Mademoiselle de Scudery ’s Clélie. They name the villages of Tendre : Billets-Doux (love letters), Petits-Soins (tender loving care), Jolis-Vers (pretty or lovely poems). Moreover, they complain because the young men did not wear feathered hats and designer clothes: “de la bonne faiseuse” (from the right maker). They then announce that they are changing their names. Cathos, Gorgibus’s daughter, wants to be called Polixène and her cousin Magdelon, Aminthe. [i] Jean-Claude Tournand, Introduction à la vie littéraire du XVIIe siècle (Paris : Bordas 1984 ), pp. 47-75.